You guys, it was so great. I feel like I learned a great deal about the process of creating dances through improv, and it was cool to dance in an environment where technique wasn’t even a thing. The guys from Pilobolus basically said, “We love dancers and we love dance technique, but if you’re someone who spends hours every day in class, please check your technique at the door.” As someone who loves technique but can get a bit too invested in it, that idea was very freeing. I am a horrible person, and have forgotten the names of our ambassadors of Pilobolus, but they were both very cool guys and very good teachers — though this process was as much one of bringing out what’s already there as one of teaching. The teaching part was more about figuring out how to use what’s already there. …But apparently I overlooked the part where, like, you know, dancing? …When I was worrying about that. If dance is involved, I seem to do relatively okay in groups of new people. At the end of class, we broke into three groups and created three short (about 4 minutes) dances in the span of about five minutes, performed them, critiqued them, refined them over another two (two!) minutes, then performed them again. All three dances were completely different, and all three of them were cool, but one (not my group’s; ours was silly) was really stirring and moving. I hope some of the dancers will take it and run with it, because it was really, really good. I feel like I want to let this whole experience percolate a bit more, then write about it at greater length. It was, in short, just an amazing two-ish hours (happily, we ran over the original 1.5-hour class time). It turns out that Pilobolus holds a 3-week summer workshop series (in Connecticut, yay!). I’m going to have to seriously consider whether I can figure out how to afford at least one week this year. Curiously, the name of the third workshop, Vision & Revision, was also the name of my favorite writing class when I was in high school. And Now: All Up In My Drawers! I did manage to make it to IKEA afterwards. My one real goal was to acquire a second Big Blue Bag, which will greatly improve my laundry system. Heretofore, I’ve been using one Big Blue Bag and any of my various not-quite-as-ginormous shopping bags. The second Big Blue Bag wasn’t essential, but it will make the system run more smoothly, since now I’ll have two dedicated laundry bags of the same size. While cruising through the store (you guys, it is so nice to walk through an IKEA all alone), however, I found something even better: specifically, Drawerganizers(TM). I’ve been meaning to implement a boxes-in-the-drawers system for a while, but hadn’t found Drawerganizers that worked for me (shoeboxes would have been fine, probably, but we didn’t have any). The Skubb series works really nicely, and I couldn’t argue with the price — something like $8 for the set — or the portability factor. The boxes fold up rather ingeniously; when you set them up, little zippers in the floor panels add tension that keeps them in shape. Bottom Drawer (technically the second drawer from the bottom; the real bottom drawer houses bed linens): this one’s full of bike kit, a few pairs of shorts, and a bunch of t-shirts that I should probably donate, since I don’t wear them enough. Bike kit used to share the dance clothes drawer (which was the Bike Kit Drawer until I had too much bike kit to keep it all in one drawer), but then the dance kit kind of took over. Anyway, I’ve used the two medium-sized Skubb boxes to contain bike kit. 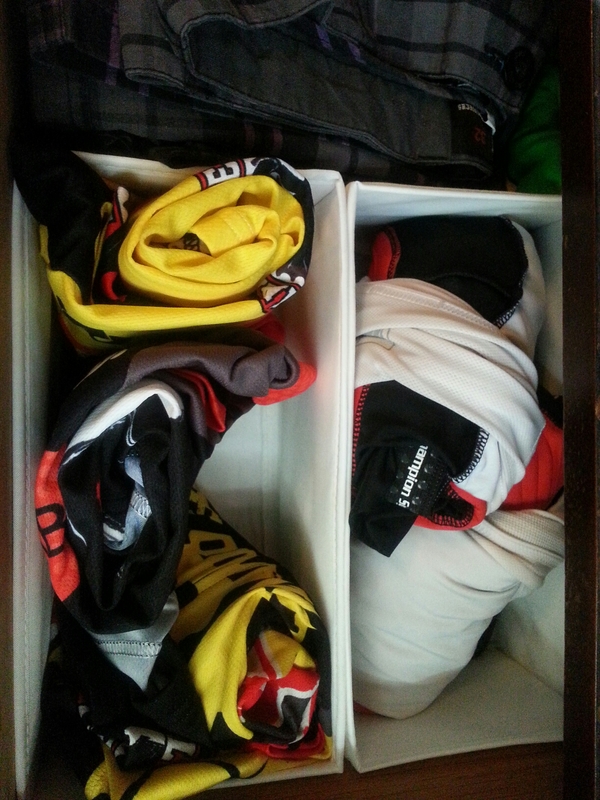 Overflow bike kit lives in a vertical organizer in the guest room closet, because I am apparently unusually sentimental about my Cabal jerseys, even the ones I don’t wear very often. And, yes, there’s even a sarong in there, though I don’t think you can see it in this shot. Next time I’m at IKEA, I’ll pick up a couple more Skubb boxes to corral the things that are still roaming free. Top Drawer: Dance kit and almost nothing else. Until recently, I’ve alternated between folding and rolling my tights, and found that neither really prevents everything from coming undone when I’m digging for that one pair with the pictures of mountains on it or whatevs. The other day, I hit on the solution of buying a package of brightly-colored hair ties to keep them contained. It works brilliantly. In combination with the hair ties, the Skubb boxes keep things corralled and controlled. No more tights rolling into the base-layer section; no more dance belts hiding under legwarmers (right now, for decency’s sake, they’re hiding under a pair of socks instead). Things that didn’t really fit anywhere else take up the extra space in the drawer in front of the Skubbs. On Top Of Ol’ Dresser: Denis’ tights live here, along with our white-noise machine (which is really an air purifier), a photo from our wedding, and a terrifying doll that predates my tenure in this establishment. There are also some foam panels that insulate our air-con when it’s installed, but right now it’s still on vacation. I found the plastic basket at a place called Five Below, but you can find similar ones just about anywhere. The fact that Denis has his own tights-basket means he no longer asks me where his tights are (when they’re right freaking there!) or roots through my dance-kit drawer, leaving chaos in his wake. Seriously, the man is like a water buffalo sloshing around in a pond when he gets in there. My married peeps (and anyone with kids or particularly egregious housemates; similar things can happen in kitchen drawers) will understand how this helps keep me out of prison. A cheap keychain-grade carabiner slipped through a convenient opening in the “weave” of the basket holds the hair elastics that aren’t currently in use. I’ve oriented it so the gate can be operated without removing the whole carabiner: you just slide a band up to the top, open the gate, and the band comes right out. The process for replacing one is similarly painless. I had to think long and hard about how to implement this bit, because my husband is a lazy slob (and will happily tell you so himself). The idea is to make it so freaking easy to put the bands back that it’s basically easier than not bothering. You guys, I seriously believe in the power of harnessing the path of least resistance. Remember, when (ahem) shaping (ahem) the behavior of spouses, appealing to the natural laziness of the human animal will save you many headaches. So, there you have it. A tour of how things are staying organized all up in my drawers (dancers be like, “Wait, isn’t that what dance belts are for?” :V). …And, now, on to the rest of the house. *So organize. Very boxes. Wow.